Running very rough. Pulled the plugs and the electrode is pushed against the other electrode. Virtually no gap. What’s happening? Bill, From an earlier post you listed your build being a 331SBF with Trick Flow 205cc heads. From the Trick Flow catalog they list an Autolite 3924 as the plug if that helps. That is strange. I would think not possible that they'd design their highest flowing heads, which folks would put high lift cams in and then place the spark plug in the path of the exhaust valve travel? I'd make sure you have fresh gas, plug gaps @ .035". Whats your Base and full advance set at? Last edited by spdbrake; 09-13-2018 at 09:11 PM..
Would detonation push the electrode flat? Seems weird. Timing hasn’t been set yet. Haven’t noticed any detonation issues. Last edited by spdbrake; 09-13-2018 at 09:29 PM.. Thanks a bunch. I believe the timing is too far advanced. I’ll reset it tomorrow. Ignition timing isn't going to affect PTV contact. The engine need to be torn down, at least head removed. "Possibly" a thicker head gasket will fix the problem. It sure sounds like some mismatched parts (pistone/rods). Possibly if the exhaust lobe on the cam is higher than the intake and this doesn't happen at lower RPM then you may need a stronger valve spring. I did see this happen on a car that some guys were building to drag race. It ran OK at idle and lower RPM but when they started to open it up the valves hit the pistons and completely wrecked their motor. They went to the cam manufacturer and they told them the valve springs they used were way to light and they needed much stronger ones for that cam. And as Undy said, there could be some mismatched parts. Anyway I hope the fix turns out to be a simple and easy one. It's been awhile since I've torn down a small block motor, but I don't believe that the valves can hit the spark plug. If anything is hitting the spark plug it would seem that it would have to be the head of the piston. 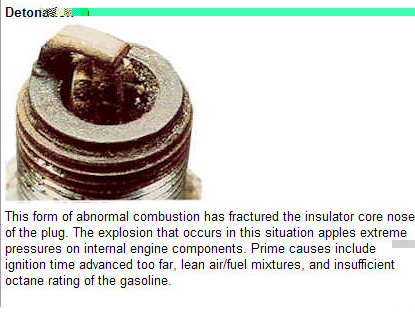 That tells me that possibly the spark plug is being used is wrong was too deep ahead or the engine was built wrong. What am I missing? Valves hitting the plug sounds impossible. The plug would have to be WAY down inside the chamber. Something else is going on there. After analyzing the situation more, I’ve come to the belief the piston domes are kissing the plug electrodes. I just got off the phone with the tech support guy at NGK spark plugs. Told him my situation and they were able to find a shorter spark plug with a better heat range for my compression. Going to get those today install them tonight and crank it over without the coil wire attached. Then I’ll pull a couple plugs and see if that fixes the problem. Bill, had you been using the 3924 or its equivalent? If so, hope the shorter plug does the trick. Mighty strange, if the proper parts have been used. If that fixes your problem, would it make sense to pull the heads and check the pistons for damaged crowns? Dan, I just don’t want to do that. I really don’t. 0.100 shorter should be plenty - if you need more than 1/2 that your current plugs would show a lot more damage than just closed electrodes. A cheap endoscope will allow you inspect the piston tops and camber areas. Bill D and DanEC like this. Last edited by spdbrake; 09-14-2018 at 12:49 PM..